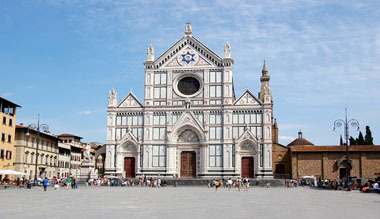 Santa Croce | Travel to Florence.com, your online travel guide. The Santa Croce Basilica, or Basilica of the Holy Cross, is a Franciscan church and minor basilica of the Roman Catholics located in Piazza Santa Croce in Florence, Italy. The site was once marshland outside the city walls that became the burial place for some of the most famous Italians. It is also known as Pantheon of the Italian Glories, because Michelangelo, Galileo, Rossini, and Marconi are a few of the famous people buried there. The Basilica is in the eastern part of the city, north of the Arno River. It's stunning facade is made from multi-colored marble and is crowned with a gothic style bell tower. Once you enter the basilica you will know immediately that this isn't just another beautiful church. The genius and creativity of the space is almost overwhelming. The current building construction, which replaced an older building, was started in 1294, by Arnolfo di Cambio, a famous architect of the period. 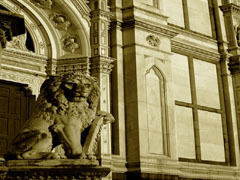 It was funded by the wealthiest families of Florence and contains the artistry of many famous ones. The façade of the basilica was built by Nicola Matas between 1853 and 1863. Many famous Florentine artist works are present in the church, besides Giotto's works. Benedetto da Maiano, Antonio Canova, Cimabue Andrea della Robbia and Donatello are a few of the contributors. Antonio Rossellino, Santi di Tito and Lorenzo di Niccolo made other artistic contributions. Giorgio Vasari decorated Michelangelo's tomb with works by Valerio Cioli, Iovanni Bandini and Battista Lorenzi, and of course, himself. Besides the famous Michelangelo's Tomb and Galileo's Tomb, the Santa Croce Basilica was a place of worship for greatly honored Florentines, and many of them are buried or commemorated there. Of the sixteen chapels, wealthy families, such as Bardi and Peruzzi own a couple of them. Monuments have been erected for over 500 years to other famous Florentines such as Dante, Giovanni Gentile, Enrico Fermi and others by famous artists of their times. The church is one of the most beautiful buildings in Florence and is a work of art in its own right. This town square used to hold public meetings, but now souvenir shops are booming and there are plenty of restaurants and entertainment. The Basilica is in the eastern part of the city, north of the Arno River. You will see the stunning façade made from the multi-colored marble, and the gothic style bell-tower, as you enter Piazza Santa Croce. You know it isn't just another beautiful church, once you enter. The genius and creativity in the room is almost overwhelming. As you enter the grand and lavishly decorated Basilica, laid out in the shape of an Egyptian cross divided into three aisles by octagonal pillars, you will see the tombs and monuments. To the right is Michelangelo's tomb and on the left is Galileo's tomb. Bruni's tomb is on the right, towards the end and Machiavelli is on the right midway down. It is truly an incredibly humbling experience.